I’m only posting this to inform you, esteemed reader, of updates in the day of A Beautiful City. Called in as a last minute expert for Jamie Oliver, I appeared in Australia’s Sunday Times (Perth) to comment on the transformation of William Street due to Jamie’s Italian restaurant now there. This was really embarrassing because it means I now have to humble-brag everywhere I go. I can cook tomatos – I can’t roll sushi. The best thing about William Street design is not the retailers at the moment, it’s the shopfronts and pedestrian realm. Jamie’s could well have been an independent restaurant, which would have been better. And the steel chairs out the front are not good. Go wood. Steel is cold on your appendix. We don’t have to pretend that super-tenants revitalise our streets. But without their cash, landlords cannot proceed, usually. Unfortunately, Jamie’s does not get a good reviews on Urbanspoon, hence my sour ending. You could say the people are disappointed. *Except for Capri – but you go there to see a Nonna in her slippers. Below: An example of an after-5 peak in foot-traffic. 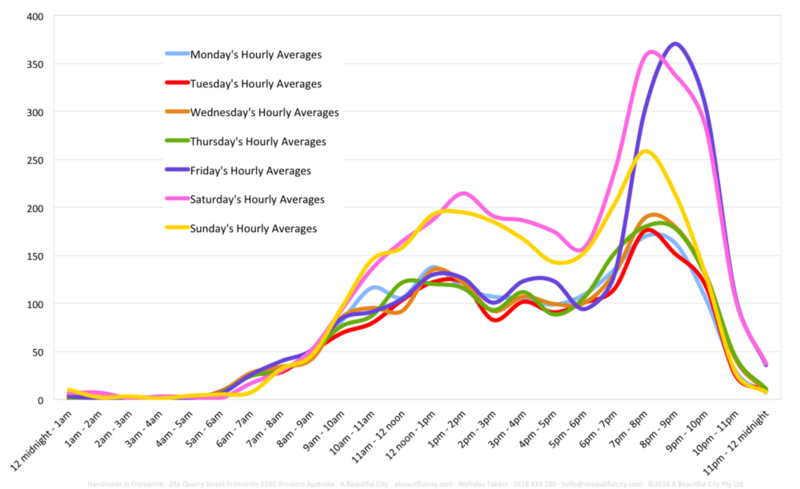 Average hourly footfall for each day of the week in Albany Highway, East Victoria Park, Australia.